Welcome to another challenge here at Use Your Stuff! It's Anne. I am a new dt member here and am very excited to be hosting my first challenge this week, which by the way is super easy! 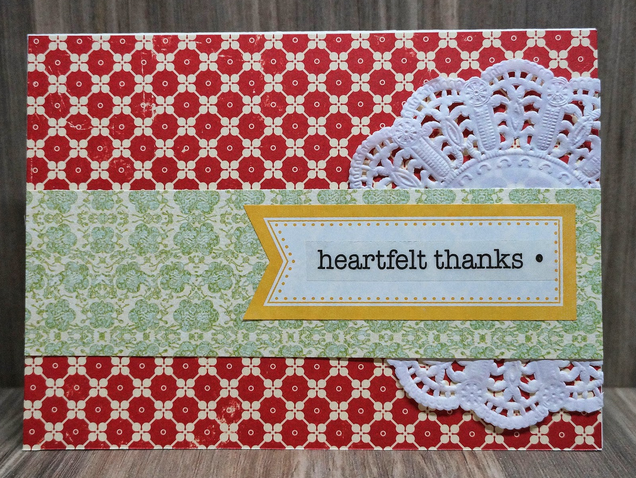 This week I'd like you to dig into your stuff and use patterned paper on your project! We all have it and after using only half or some of the paper I know you have some leftovers! Here's a little inspiration to get you started. I thought I'd use some family photos from Easter, so you could start to get to know my little family! Please remember to link your project back up here. This was an 'easy peasy' challenge for me as I rarely use solid cardstock other than black or white. Years ago I started a second heritage album with all the titles being the year of the picture(s). Here is one from 1940 of my in-laws. I apologize for the picture quality, but you scrap what you have, right?? I have a ton of patterned paper too but I generally use solid colors for the background so this was a great challenge! This is my little man at three months old. Just popping by with a card I made. I am on a use my stash personal challenge. Not consumables till I made 50 cards. Reached my goal yesterday! Will take me a while to get all the cards posted on my blog! Lots of fun stuff this week! Thanks for a great theme! Beautiful creations by the team! Thanks so much for the challenge! Hi there! My name is Heather and I have a question about your blog! If you could email me at Lifesabanquet1(at)gmail(dot)com I would greatly appreciate it! Gorgeous DT Creations!! Love Amanda's layout.. all the different layers.. the colors.. Just beautiful!! Thanks for another fun challenge!